Just looking up average car insurance rates online will not give you a good estimate of how much you will be paying for your car insurance. You will get an idea of how much car insurance costs in general so you can budget it in when planning to buy a new car or are considering getting full coverage on your existing car. Before you buy a new car, consider cheap cars to insure to save more money. As I did the research for this article I found that there are different results out there and the averages vary from company to company. The main thing here is that we still get an average. Let’s take a look at the two companies that are reporting averages below. According to homeinsurance.com, and their chart above, people in the United States spend about $960 per year on car insurance (in 2013). 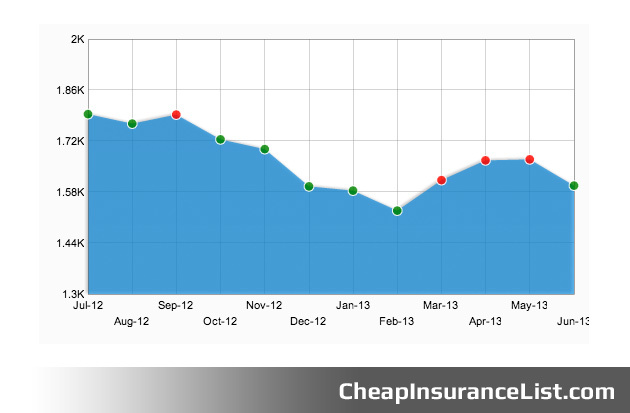 If you look at the chart from carinsurance.com above, you will see that theirs is reporting an average of $1500 per year. what your driving record says. From what we found out above you can see that you should plan on having anywhere from $1200 to $1500 per year to spend on car insurance but to get more specific you will need to get a few quotes. Why do I say a few? Because for you to get the best deal, you need to go shopping, shopping for insurance. Get at least 10 quotes and then compare them. Before you do that though, make a list of requirements that you want your insurance to cover and stick to them with each quote, that way you will be comparing apples to apples and not to steak. And even before you dive into that, I recommend gathering as much car insurance information as you can so you know how this car insurance business works and how it can benefit you.